I am not one of those people who generally works without a recipe. I don't particularly enjoy throwing a bunch of ingredients together to see what happens because I am desperately afraid of disappointing those eating it. It's not as bad as it used to be - I'm venturing off the beaten path some - but I'm perfectly happy with recipes. That wasn't destined to work last week as I prepared a sugar-free dish for our revival dinner. I had researched some dessert recipes because I had never made anything diabetic-friendly before. 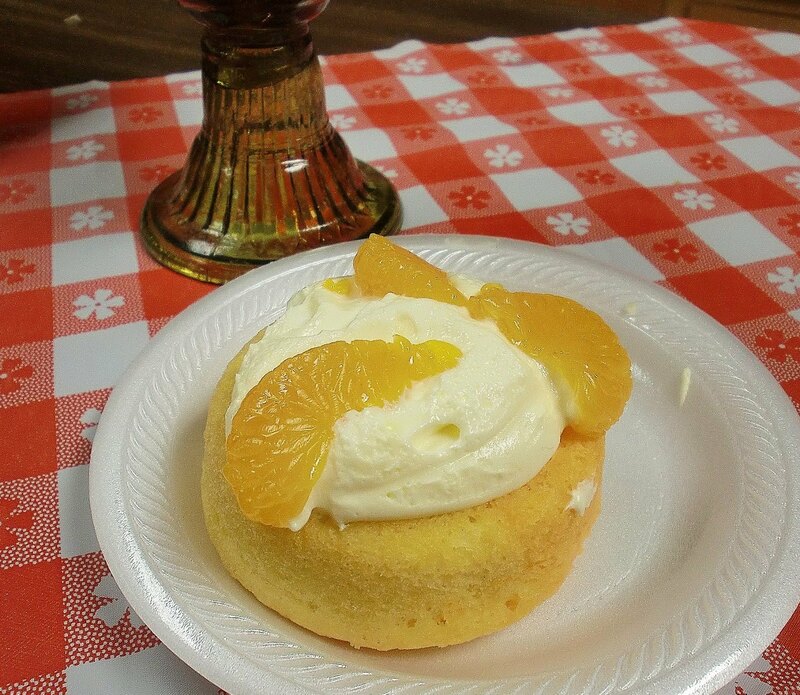 I had my Orange Angel Food Cake Dessert recipe in hand and I was ready to go. And then Murphy's Law kicked in. The first ingredient on the list was an angel food cake box mix. Well, I chose to go to the store and buy one instead to save a little time. Would you believe it - our grocery store didn't have a single one pre-made. I had run out of time and couldn't make one, so I had to think on my feet. Instead of one big pan of dessert I decided to use mini dessert shells for individual servings. Problem one solved. The rest of the ingredients were no problem. I got back into the kitchen and went to work. The next step was making the orange gelatin to pour over the cake for extra taste and presentation. (It solidifies in the cake and makes stripes.) But when I made the gelatin, I used the package directions and not the recipe's modifications. It was too runny, but I poured it over the cakes anyway. I was truly blessed that after a few hours in the refrigerator, the gelatin didn't make the cake solid like the recipe, but became a soaked flavor that was fantastic. With that cooling time, the cake became more sturdy and smelled wonderful. It wasn't what I had planned, but it sure worked! The topping in a mix of sugar-free pudding, orange extract and reduced-fat whipped topping. It was smooth, easy to divide among the cakes and had a light, sweet smell. Then I changed the recipe a little more because I was using small cakes. The recipe called for slices of orange, but one slice would have covered my entire little cake. Instead I used slices of mandarin oranges in a spiral around the top - perfect! 2. Poke small holes in cakes with a fork. Pour gelatin over cakes. Chill until set. 3. In a large bowl, whisk milk and pudding for 2 minutes. Whisk in extract. Let stand for 2 minutes. Fold in whipped topping. 4. When cakes are set, dollop topping into each divot. Garnish with orange slices. Why Bother To Memorize Scripture?